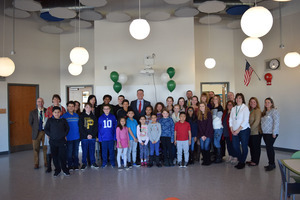 Last week the Brewster PTAs, PTSA, and SEPTA held a celebration to thank Senator Terrence Murphy. 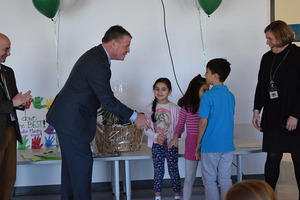 In his four years in office, Murphy has advocated for Brewster’s interests in Albany and sent extra funds that helped to maintain district programs. Representatives from all four of the district’s schools were on hand to give thanks and gifts to the senator. 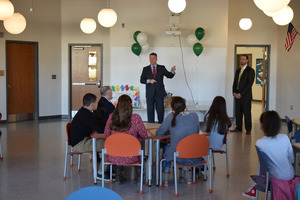 Julia Villani from Brewster High School’s Democratic Congress presented a proclamation thanking Murphy for all he has done for the high school includingsecuring multiple grants that helped the district to buy new mats in the wrestling room, refurbish the baseball field and enhance the district’s mental health counseling program. Brewster Athletic Director Dean Berardo joined the superintendent to present Murphy with an honorary Bears coach t-shirt.